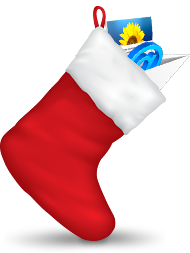 We’re happy today to take the wraps off a special holiday present for all our fantastic Direct Mail customers. Direct Mail version 3.6—available today—includes a host of bug fixes and improvements, including one new feature, in particular, that we’d like to tell you about. A primary focus of this update was improving the template editor experience. We want Direct Mail to be the easiest way to put together the best looking emails out there. With that goal in mind, here are a few of the improvements we made in version 3.6. These new flexible layouts make it incredibly easy to put together the perfect layout in just seconds. To support our customers around the globe, we’ve translated key portions of our templates (like unsubscribe links, view online links, company name, etc.) into German, Spanish, French, Swedish, Italian, Dutch, Portuguese, Russian, and Japanese. When you select a template in the editor, you’ll see the translated version appear automatically. 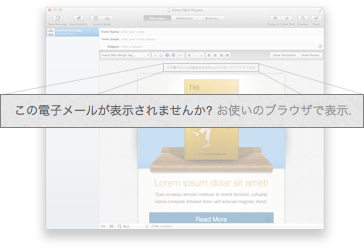 Direct Mail references your OS X language settings when choosing which language to present. As you browse through our collection of templates, we hope you’ll notice the refined typography and better selection of built-in color schemes (which you can always customize to match your favorite colors). After you send your newsletter, your recipients will notice how much better they look in their email client. We’ve gone through each template and made a host of changes to ensure they are easier to edit and are more compatible with the most popular email clients. The features described above are available in the templates that come built in to Direct Mail. If you’re already using a template from an older version of Direct Mail, you’ll need to create a new message and choose the updated version of the template from the template chooser. In other words, editing or duplicating an existing message won’t give you access to the aforementioned new template features. Templates aren’t the only thing we’ve changed in this update. We’ve fixed a plethora of bugs and spent many hours enhancing and refining the features you already love. If you like, you can view the release notes or just jump right in and download the update. Thanks for all your feedback and suggestions. We look forward to unveiling the next generation of Direct Mail in the New Year. From all of us here at e3 Software, we wish you a wonderful holiday season with family and friends and a Happy New Year! Update: Direct Mail 3.6 is now also available in the Mac App Store!